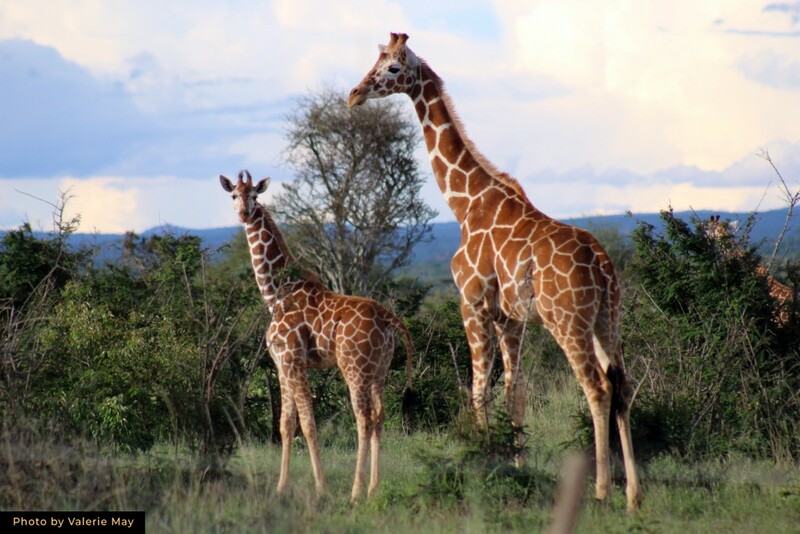 Tall, elegant and with delicate strides characterised by an effortless ambling walk or gallop, the giraffe is a favourite animal for many people here on Mpala, the home of African wildlife on Explore.org. The name “giraffe” comes from the Arabic word for “graceful.” One of the most distinguished of all African mammals, the giraffe is the tallest animal on the planet. Its long neck gives it an advantage in reaching food and in detecting danger from great distances. Its coat consists of large, polygonal, liver-coloured spots outlined by a network of bright-white lines. The blocks sometimes appear deep red and also cover the legs. Africa’s rich history is embedded with imagery depicting this ever elegant animal. Historians and archaeologists have found paintings and engravings on rocks all over Africa from Morocco, Algeria and Libya in the north, through Ethiopia, Somalia, Kenya and Tanzania in the east, to Botswana and Zimbabwe in the south. In the ancient Egyptian civilization, royal tombs were decorated in bronze giraffe etchings and sculptures. Recently on Mpala, we had an up-close interaction with two wounded male giraffes. 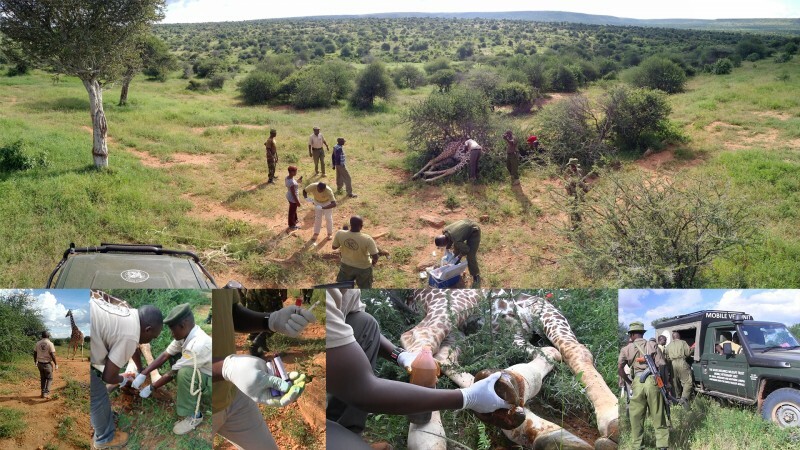 The Kenya Wildlife Service (KWS) mobile veterinary unit was on site following a call from Mpala’s security. The first animal had what Dr. Dominic Mijele, the unit’s vet, described as an interdigital space wound. This is a painful injury in the rear left hoof. On the second giraffe, we found a wire that had cut into the flesh at the base of the front left foot, telltale signs of a failed snaring attempt by poachers. The operation to treat the giraffes lasted three hours. “While giraffes are very strong and fast, they are also very delicate because of their long necks and massive bodies.” Dr. Mijele explained the travails and risks present during the treatment of a giraffe. Once immobilized with a drug shot from a dart gun, the giraffe will rarely go down unassisted. They can remain on their feet and fall asleep or take a quick nap without going down. Interestingly, giraffes will almost never sleep for longer than five minutes at a time, often modifying their position so that they remain standing with their head and neck curved around to rest on their hindquarters. “It is not easy bringing down a 3000 lb (1300kg) animal. The risk of hurting the animal or yourself in the process is very high but we have a highly trained team,” Dr Mijele assured us. In a few tense moments, rangers quickly run a rope around the animal’s legs in an attempt to trip it. While sedated and barely awake, the giraffe can still kick, the only defence it has against an attack. The treatment of the two male giraffes was a success and they loped off into the bush with every expectation of healing completely. “With more collaborative efforts between stakeholders in the conservation sector, we will continue to see bigger success in the region and beyond. We are truly thankful to our partners, The David Sheldrick Wildlife foundation for sponsoring the mobile vet unit, and Mpala Research Centre for making this day a success,” said Dr. Mijele. The KWS mobile vet unit in Laikipia has helped to save hundreds of animals including elephants, Grevy’s zebra, rhino’s and lions. 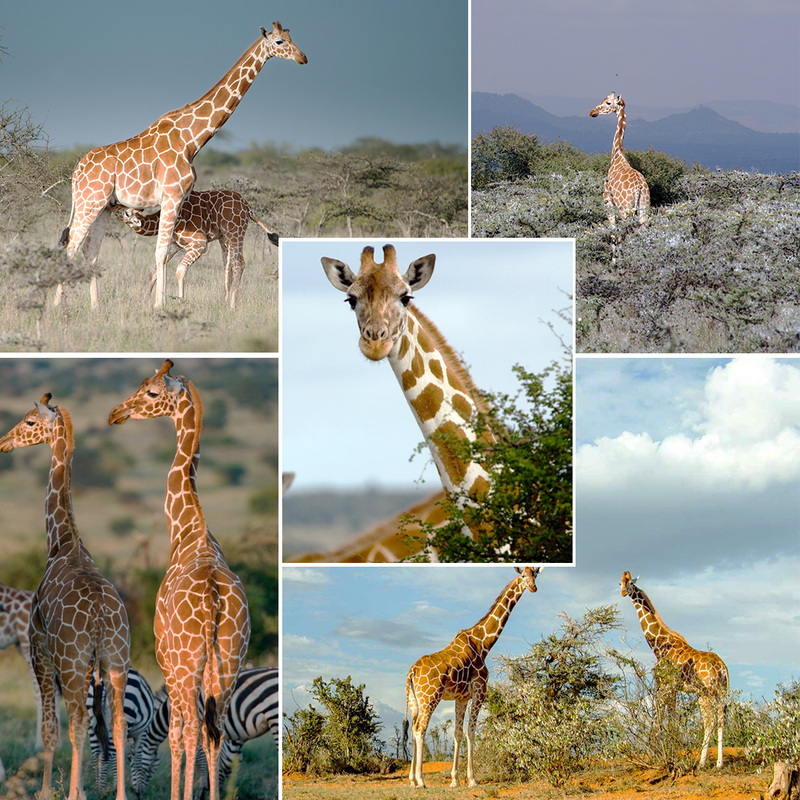 The IUCN recognises one giraffe species with several subspecies including Rothschild’s and the reticulated giraffe. Here in Laikipia and on Mpala, the reticulated giraffe dominates the landscape and is a common sight on the live cameras on Explore.org. However, the reticulated giraffe numbers have dropped massively in recent years. Today, it is listed as threatened and in January 2018, a citizen science campaign spearheaded by Grevy Zebra Trust and scientists at Mpala embarked on an ambitious census covering the northern Kenya region to hopefully photograph and count as many reticulated giraffes as possible. It is estimated that fewer than 5000 remain in the wild down from an approximate 28,000 in the late 1990’s. Apart from human activity including poaching and territory segmentation, lions are the principal predators of giraffes. The fact that more than half of the current giraffe population is over four years old is indicative of the high predation of calves by lions. During their first year, calves nearly double in height, which helps make them a less likely target for a predator. Once they are grown, they use their powerful legs to fight off lions and other attackers. In the coming week, on Saturday, June 23rd, 2018, the Grevy’s rally census results will be announced during The Great Grevy’s Ball. Viewers on Explore.org around the world can only hope for good news about this iconic species we are proud to have here at Mpala, the home of African wildlife on Explore.org.